I have always been a firm believer that more than the food being served, the overall experience that a restaurant can offer is what matters the most. 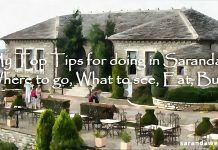 That is why when my husband and I visited this one dining place in Saranda, I was blown away because everything was so much more than what I expected! Dubbed as one of the best restaurants in the area, I definitely had high expectations when I first set foot inside Centrali. 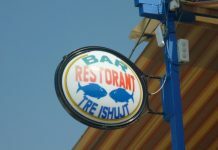 The truth is we have already heard so much about this bar and restaurant, with many people saying that more than the very good food and very good drinks, the place also offers the most amazing service that they have ever seen, with some even claiming that it was the classiest service that they have found around Saranda. We were greeted by the friendly and warm smile of one of the staff and ushered to a table on the corner that gives us a great view of the entire restaurant. To be very honest, of the many restaurants that I have visited before, this is one of the rarer places where you can really feel very much welcomed because all members of the staff are more than happy to be at your service. It is very obvious that they are extremely professional and are truly committed to meeting and even exceeding the needs of their customers. I noted right away the calming, relaxing and pleasant ambience of the place. 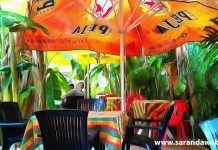 I also forgot to mention that it is located on the perfect spot on the promenade so you can really have an amazing view as people go on with their personal businesses outside. Now, here comes the best part of them all. I have only one word for their menu: excellent! Yes, everything is excellent. Since I am a big fan of seafood, I decided to try their seafood dishes. Honestly, I was a bit confused at first when I checked the menu because I wanted to eat everything and so was my husband. Finally, I settled for prawns and fresh fish. As for my husband, he chose their grilled steak. When our meals arrived, I was more than satisfied with the presentation: everything was fixed perfectly that made us want to dig in right away. But the best thing happened when we took our first bite. My husband and I were speechless because the initial bite was more than heavenly. The prawn, I am pretty sure, was very fresh and the fish is also equally sumptuous. My husband gave me a bite of the grilled steak and again, I was at lost for words. It was grilled to perfection! The meat was cooked properly and its natural juice will surely make you want to order another plate. Will I Recommend Bar & Restaurant Centrali? Of course, I will! Probably the best restaurant that I have ever visited, I look forward to visiting Bar & Restaurant Centrali again and this time, I will bring all my family and friends to enjoy the experience for themselves!